For quantitative determination of glucose and evaluation of drug effects on glucose metabolism. • Sensitive and accurate. Use as little as 20 μL samples. Linear detection range in 96-well plate: 5 to 300 μM (90 μg/dL to 5.4 mg/dL) glucose for colorimetric assays and 1 to 30 μM for fluorimetric assays. • Simple and high-throughput. The procedure involves addition of a single working reagent and incubation for 30 min at room temperature. Glucose (C6H12O6) is a key diagnostic parameter for many metabolic disorders. Increased glucose levels have been associated with diabetes mellitus, hyperactivity of thyroid, pituitary and adrenal glands. Decreased levels are found in insulin secreting tumors, myxedema, hypopituitarism and hypoadrenalism. Simple, direct and high-throughput assays for measuring glucose concentrations find wide applications in research and drug discovery. 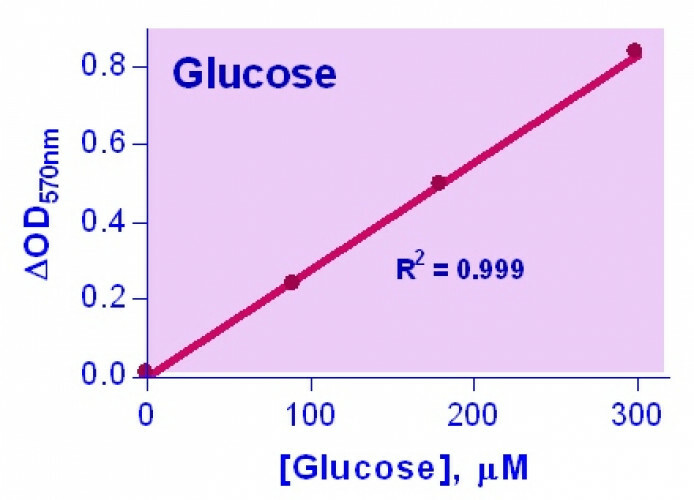 BioAssay Systems’ glucose assay kit uses a single Working Reagent that combines the glucose oxidase reaction and color reaction in one step. The color intensity of the reaction product at 570nm or fluorescence intensity at λex/em = 530/585nm is directly proportional to glucose concentration in the sample. Applications For quantitative determination of glucose and evaluation of drug effects on glucose metabolism. 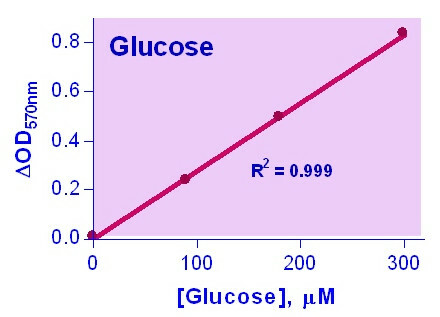 References Assay: Glucose in Mouse Plasma (Pubmed). 2. Wolfgang MJ et al (2007). Regulation of hypothalamic malonyl-CoA by central glucose and leptin. PNAS 104(49):19285-90. Assay: Glucose in Mouse blood (Pubmed). 3. Cha SH et al (2008). Differential effects of central fructose and glucose on hypothalamic malonyl-CoA and food intake. PNAS 105(44):16871-5. Assay: Glucose in Mouse blood (Pubmed). 4. Dhar A et al (2010). Alagebrium attenuates acute methylglyoxal-induced glucose intolerance in Sprague-Dawley rats. Br J Pharmacol.159(1):166-75. Assay: Glucose in Human plasma (Pubmed). 5. Drew BG et al (2011). Reconstituted high-density lipoprotein infusion modulates fatty acid metabolism in patients with type 2 diabetes mellitus. J Lipid Res. 52(3):572-81. Assay: Glucose in Human plasma (Pubmed). 1. Wolfgang MJ et al (2006). The brain-specific carnitine palmitoyltransferase-1c regulates energy homeostasis. PNAS 103(19):7282-7. Assay: Glucose in Mouse Plasma (Pubmed).